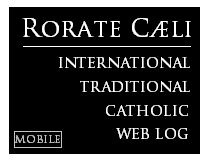 RORATE CÆLI: What was black is now white: Pope "changes Catechism" to declare death penalty "inadmissible in all cases". What was black is now white: Pope "changes Catechism" to declare death penalty "inadmissible in all cases". The Church was wrong in a major issue literally of life and death. 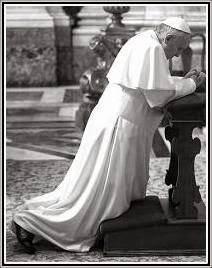 Is the Pope a kind of "Prophet", as the "First President" of the Mormons, receiving new teachings that contradict completely teachings that the Magisterium had taught since Apostolic Times? The anachronistic boldness in this decision is astounding: what is merely a modern view of a secularized Europe becomes a completely new teaching, without even the consideration that the current situation of the world will not remain the same for all time -- as if the secular European present of stable peace would remain forever the same, as if what was common in the past and since the dawn of time would never be possible anymore. The boldness of a personal opinion becoming a completely new and unprecedented "teaching" of the Church. If such a certain doctrine of the Church (of the possibility of the death penalty at least in some situations), affirmed by Christ Himself in Scripture -- when, confronted by Pilate who affirmed his right to inflict capital punishment, Christ told him, "You would have no authority over Me if it were not given to you from above", affirming that it is a power granted to the State in its authority, even if, as all governmental powers, it can be exercised illegitimately and unjustly -- can be changed, then anything can be changed. A "development" of doctrine that is in fact a lopsided inversion of doctrine may bring about anything: from the end of the "intrinsic disordered" nature of homosexuality to the priestly ordination of women, from the possibility of contraception in "some" cases to the acceptance of the Lutheran understanding of the Real Presence in the Eucharist as a possible interpretation of what the Church has always believed -- and so on. The current Pope has far exceeded his authority: his authority is to guard and protect the doctrine that was received from Christ and the Apostles, not to alter it according to his personal views. We are reaping the rewards of an unchecked hyper-clericalism: the same hyper-clericalism that allowed for abuses of people like Theodore McCarrick to go ignored and unpunished and now allows for the recklessness of the alteration of established doctrine received from Christ and the Apostles. Francis has violated radically the Doctrine of Papal Authority as defined by Vatican I (Pastor Aeternus: "The Holy Spirit was promised to the successors of Peter not so that they might, by his revelation, make known some new doctrine, but that, by his assistance, they might religiously guard and faithfully expound the revelation or deposit of faith transmitted by the apostles"). He is in open violation of the authority recognized to him by Christ and His Church throughout the ages: he has abused his authority by pretending to have an authority that he has not. That is absolutely ridiculous, and a shameful and pathetic excuse: the Catechism is not a lobbying tool to modify laws: it is supposed to be a collection of the everlasting teachings of the Church.